Todd Whitaker, Jeffrey Zoul, and Jimmy Casas are widely acclaimed experts on teaching and leading and are pioneers in the education twitterverse, and now they are sharing their best practices! In What Connected Educators Do Differently, they show how being a connected educator—by using social media to connect with peers across the country and even across the globe—will greatly enhance your own learning and your success in a school or classroom. You’ll find out how to create a personal and professional learning network to share resources and ideas, gain support, and make an impact on others. By customizing your professional development in this way, you’ll be able to learn what you want, how you want, when you want. Best of all, you’ll become energized and inspired by all the great ideas out there and how you can contribute, benefiting both you and your students. Whether you are a teacher or school leader, you will come away from this book with step-by-step advice and fresh ideas to try immediately. Being a connected educator has never been easier or more important than it is right now! "What Connected Educators Do Differently should be required reading for those working with students and staff in today’s fast-moving digital world. Whitaker, Zoul, and Casas are dynamic leaders who fully understand the importance of connecting beyond one’s immediate surroundings to build a network of excellence to best facilitate learning." 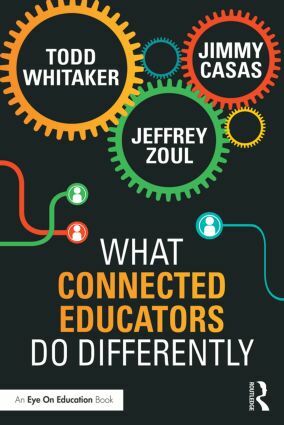 "Whitaker, Zoul, and Casas offer readers practical suggestions for becoming a connected professional in today's educational landscape. Not only do these three experts share a wealth of information for getting connected to learn, share, and grow together, but they also do so in a manner that encourages putting people first to create a truly effective and positive school culture for everyone involved." "This is the definitive guide to being a connected educator! You will learn from cover to cover not only how to be a connected educator, but also why we should be connected. Practical tips, advice from multiple experts, and empowering stories will fire you up to become the change education needs!" "Todd, Jeff, and Jimmy share an insight on more than being a "connected" educator, but on learning and making a difference for the reader and others. Their enthusiasm throughout the book is contagious, but it is their practical and simple steps that they share from both their experience and research that will make a world of difference in your practice, ultimately leading to better learning opportunities for yourself, and your students." "Educators are sharing and connecting more than ever--with students, with parents and community members, and with each other. How well we do our jobs has become ever-more dependent on the quality of our connectedness and communications. What Connected Educators Do Differently raises the bar for how these connections need to happen, and for how they can radically improve what we’re doing for students." "I often recommend Todd Whitaker's books whenever I get a chance so having him partner with exceptional school leaders like Jimmy Casas and Jeff Zoul on such a powerful resource for today's educators is amazing. Through specific examples, practical ideas, and humor, this book will encourage educators who are already connected to continue their work and inspire those who are curious about becoming a connected educator, but don't know where to start. This will become a major book in my library and one that I will gift to new teachers!" "The brilliance of this book lies in the stories that illustrate the countless reasons why educators should be connected in online and global--not just local--communities of practice. The Follow 5, Find 5, and Take 5 sections at the end of each chapter are fantastic!" "What Connected Educators Do Differently is a great resource all educators should read. Todd, Jeff and Jimmy lead by example in their daily work and share their vast experience through this book. I'm not surprised by how many insightful tips and great down-to-earth information was offered considering the caliber of the authors. This is definitely not one to miss." Dr. Todd Whitaker (@ToddWhitaker) is a professor of educational leadership at Indiana State University in Terre Haute, Indiana. He is a leading presenter in the field of education and has written more than 30 books, including the national best seller, What Great Teachers Do Differently. Dr. Jeffrey Zoul (@Jeff_Zoul) is Assistant Superintendent for Teaching and Learning with Deerfield Public Schools District 109 in Deerfield, Illinois. He is also the author of several books, including Improving Your School One Week at a Time and The 4 CORE Factors for School Success, co-authored with Dr. Todd Whitaker. Jimmy Casas (@casas_jimmy) is an award-winning principal at Bettendorf High School in Bettendorf, Iowa. He is also Co-Founder of EdCampIowa and Co-Founder & Co-Moderator of #IAedchat, a live online discussion chat every Sunday at 8:00 a.m.& p.m. CST.